There seems to be a bit of controversy in the so called "9/11 Truth Movement" on whether the phone calls from the planes were fake or not. The most well known proponent of this theory is David Ray Griffin and his take on the Barbara Olson phone calls to her husband Ted Olson. Let's examine this closely and see if there is any merit to this "fake Phone calls" theory. I would hope that the 9/11 truth crowd is serious on promoting the truth, and solid evidence, being responsible and promoting well researched factual "evidence". "Olson’s Story Contradicted by the FBI"
"The most serious official contradiction of Ted Olson’s story came in 2006 at the trial of Zacarias Moussaoui, the so-called 20th hijacker. The evidence presented to this trial by the FBI included a report on phone calls from all four 9/11 flights." "In its report on American Flight 77, the FBI report attributed only one call to Barbara Olson and it was an “unconnected call,” which (of course) lasted "0 seconds." "According to the FBI, therefore, Ted Olson did not receive a single call from his wife using either a cell phone or an onboard phone." "Back on 9/11, the FBI itself had interviewed Olson. A report of that interview indicates that Olson told the FBI agents that his wife had called him twice from Flight 77." "And yet the FBI's report on calls from Flight 77, presented in 2006, indicated that no such calls occurred." "This was an amazing development: The FBI is part of the Department of Justice, and yet its report undermined the well-publicized claim of the DOJ’s former solicitor general that he had received two calls from his wife on 9/11." But doesn't mention that there were 5 other calls from the flight, presented at the same trial. How come? 5 other calls...made by someone on the plane....who? Who made these calls? DRG says..."According to the FBI, therefore, Ted Olson did not receive a single call from his wife using either a cell phone or an onboard phone." However, according to the FBI, Ted Olson is being truthful. "Keyton was working in Ted Olson's Office this morning. She is regularly called there to cover the telephones. At approximately 9:00am, she received a series of approximately six to eight collect telephone calls. Each of the calls was an automated collect call. There was a recording advising of the collect call and requesting she hold for an operator. A short time later another recording stated that all operators were busy, please hang up and try your call later." "Keyton then received a collect call from a live operator. The operator advised that there was an emergency collect call from Barbara Olson for Ted Olson. Keyton advised that she would accept the call. Barbara Olson was put through and sounded hysterical. Barbara Olson said, "Can you tell Ted .. " Keyton cut her off and said, "I'll put him on the line." "Keyton advised that there is no caller identification feature on the phone she was using. Keyton didn't know if Barbara Olson was calling from the phone on the plane or from her cell phone." So as you can see, Ted Olson has several witnesses backing up his story, one is his secretary, and others are the operators who put some of these calls through. "Mercy Lorenzo, also an operator with AT&T, received a call from a female passenger on flight 77 requesting to be transferred to telephone number 202-514-2201. The female passenger advised the plane was being hi-jacked. Hi-jackers were ordering passengers to move to the back of the plane and were armed with guns and knives. Lorenzo indicated the pilot might not yet be aware of the take over of the plane." "Additionally, the number provided was the number of the passenger's husband. He is a Sergeant and resides in Washington, D.C."
Ted Olson was not a "Sergeant" he was United States Solicitor General. And notice that link is to a debunkers site. Evidence shows the calls happened as Olson said, and there’s no evidence they didn’t, so why wouldn't debunkers point that out? This nonsense of no planes, flyovers, missiles, and fake calls, and victims being "in on it" helps debunkers, Government apologists, and the very people/entities that so called "truthers" are claiming to expose. Those that promote this nonsense are assisting the very people they claim they are opposing. So Ted Olson's story is confirmed over and over again by people who don't even know him. "Event: Department of Justice briefing on cell and phone calls from AA Flight 77"
"This work was conducted in support of the U.S. Justice Department's criminal case against Zacarias Moussaoui." "While there was no direct evidence with respect to the "unknown calls," interviews with recipients (especially Lori Keyton who was answering the phone in Ted Olson's office on 9/11), plus interviews of family members of other Flight 77 passengers, has lead to the conclusion that all of these unknown calls were from Barbara Olson to her husband Ted's office." "all of these unknown calls were from Barbara Olson to her husband Ted's office." "He told me that he had dialed zero to report his plane was being hijacked..."
"Mercy Lorenzo, also an operator with AT&T, received a call from a female passenger on flight 77 requesting to be transferred to telephone number 202-514-2201.
she received a series of approximately six to eight collect telephone calls. The trial was in 2006, and the evidence presented was simply the calls. The airphone calls were classified as "unknown" because they were collect calls and no record from the airphone recorded the number dialed as the operator, ....not the person using the airphone, dialed the number. They could have gone ahead and presented the evidence to show who made these "unknown" number calls, as they already found out in 2004 as the documents show, but there was no reason to do that because Ted Olson wasn't on trial, and it would be irrelevant to the case and a waste of the courts time. Anyway, that's my guess. DRG also says there weren't any Airfones on American Airlines. Yea, that's because they were being taken out of the aircrafts. In 2002. In order to take the Airfones out in 2002, they have to be in first,.. 9/11 happened in 2001. "American Airlines will discontinue its AT&T in-flight phone service by March 31, a spokesman for the airline said Wednesday." "American will stop the service by March 31 and then take steps to remove the phones from its airplanes." I have seen no evidence that supports the notion of "fake phone calls". Only evidence that they are indeed real. If there is no evidence of fake phone calls it is irresponsible and rather outrageous to accuse people who lost loved ones on that tragic day of lieing or being "in on it", simply to keep a faulty theory alive. For years I've seen over and over the "Ted Olson is a liar" mantra put forth by the "truth" movement, led by DRG, when the evidence actually supports Mr Olson. A real big clue of someone not being "in on it" is when they, or a person close to them are dead. Like John O'Neill. Because of 9/11 he is dead. That is a pretty good clue he isn't "in on it". Ted Olson had a wife that is dead due to 9/11. DRG has no evidence he lied or is "in on it", and he has no evidence that phone calls were faked. One may not like Olson or his politics, but to accuse him of "being in on it", or to claim phone calls were faked, when there's no evidence to support these claims, is extremely counter productive and IMO offensive.The evidence shows me she was in the wrong place at the wrong time. I prefer the "truth" movement focus on truth, and have it's "facts" in order. Accusing victims of the attack as being "in on it" liars, when the evidence isn't there doesn't help a "truth" movement. It destroys it. strong scientific evidence to work with in our quest for a new 911 investigation. We should focus on this and avoid the speculative stuff. We should take advantage of our advantages. sewalkie on Tue, 12/22/2009 - 2:41pm. stick w/ the best, clearest evidence. Certainly, investigation into and discussion of unanswered/unsettled questions should continue, but when making the case to the public, put the best, most solid case forward. I've emailed DRG to make him aware of this article, and invited his response. loose nuke on Tue, 12/22/2009 - 4:11pm. Thank you for taking the time. Please send this to Dr. Griffin, and ask that he no longer promote this faulty information. Thanks. This is a good example of why you shouldn't automatically parrot what someone else is saying. It's best to do your own research for the most part. Don't rely on other people to tell you what's what. Learn for yourself. Jon Gold on Tue, 12/22/2009 - 3:09pm. I have sent it to him, but rather than "ask that he no longer promote this faulty information," I asked him what he thinks of jim's essay. I myself am going through it myself and seeing if it is a true rebuttal to the "fake Olson calls" hypothesis or simply smoke and mirrors. Adam Syed on Tue, 12/22/2009 - 4:08pm. That's the honorable way. Leaves him all the chance to reconsider and even correct eventual mistakes in jimd3100's work. Waarheid911 on Tue, 12/22/2009 - 4:16pm. From top to bottom. I'll be interested to hear a rebuttal to the rebuttal to the rebuttal just so people can continue promoting the "hypothesis" of the "fake Olson calls." Will you be one of those people Adam that continues to promote this faulty information? Let's find out. By the way... I have NEVER promoted the idea that the call to Ted Olson was fake. Just like to point that out. Jon Gold on Tue, 12/22/2009 - 4:40pm. and not blindly take HIS or YOUR word for it. I am going through it myself critically. You took the tone of "See? Debunked. Now shut up about it and move on." Doesn't work with me amigo. Are you AFRAID that I might find internal contradictions or inconsistencies? Adam Syed on Tue, 12/22/2009 - 4:58pm. "..ers think that the planes were holograms, a plane flew over the Pentagon, the cell phone calls were voice morphed, silent bombs blew up the WTC, and somehow George Bush was able to pull this off and get away with it. Whats on TV?" These are the people that might come across that Ventura guys show. Lets keep our heads about us. zombie bill hicks on Tue, 12/22/2009 - 5:44pm. silent bombs blew up the WTC? "silent bombs blew up the WTC" ?? bbruhwiler8 on Tue, 12/22/2009 - 9:49pm. referring to the point that many laymen and debunkers make that no explosives can be heard going off in many videos of the buildings falling. The fact that some videos were even apparently doctored to include the sound of explosions further detracts from credibility of the issue. Im quite aware of the testimony of explosions from various people on the scene, but Ive always found it odd that in typical videos of CDs you can always clearly hear BOOM BOOM BOOM and this is absent from videos of the WTC coming down. Either way, back on the topic of voice morphing, I just think its a valuable lesson to learn how to keep your credibility when participating in 9/11 activism. zombie bill hicks on Wed, 12/23/2009 - 8:43am. "Im quite aware of the testimony of explosions from various people on the scene, but Ive always found it odd that in typical videos of CDs you can always clearly hear BOOM BOOM BOOM and this is absent from videos of the WTC coming down." Because it's very easy to manipulate soundtracks, we have to be very careful when we use them as evidence of anything. But your generalization here is not correct. There are different versions of some of the main videos of the WTC collapses, and some contain clear and distinct booms while some do not. It is not at all clear that the ones with the distinct booms are the result of doctoring of soundtracks while the others are not. It is just as easy (perhaps easier) to modify soundtracks so as to remove these booms. Some of the versions of the videos with distinct booms seem to me to be the most authentic ones. Why? Because they fit much better with the eyewitness accounts (over 150 to date). 911SATYA on Wed, 12/23/2009 - 9:20am. Jon Gold on Wed, 12/23/2009 - 9:27am. Joe on Wed, 12/23/2009 - 9:45am. "no explosives can be heard going off in many videos of the buildings falling." He's not talking about witnesses hearing explosions. He's talking about actual explosions being heard in any of the videos of the buildings coming down. Like you often hear when watching a controlled demolition... bang bang bang bang... and then you see flashes which correlate with the bangs... do any of the videos of the buildings collapsing have any of these effects? Jon Gold on Wed, 12/23/2009 - 10:09am. I was asked about "distinct booms", not about finding sounds of explosions, with accompanying flashes, that are identical to those in standard demolitions. If these were standard demolitions they wouldn't be in dispute. This was a covert operation. The following link gives us one of the best known videos of the South Tower collapse with accompanying soundtrack. Some of the soundtracks of this video have merely a loud, indeterminate roar with no separate booms or explosive sounds. But the version here (provided the link is working) has a major boom at the beginning (presumably what leads the firefighters to turn their heads towar the tower) followed by many distinct sounds that I won't try to characterize except to say they are probably explosions (at least 10 can be heard on this version and up to 20 on others). Why do I think this soundtrack is authentic? Because it is very close to what several witnesses have described. There are other cases. For example, in Etienne Sauret's video of the South Tower coming down we can hear several distinct booms near the beginning of the "collapse." These can be captured, and have been captured, in sonograms made from the soundtrack. I'll give details if you like. 911SATYA on Wed, 12/23/2009 - 10:20am. Does have a thuddish boom in the beginning... but nothing like a "standard demolition." Is it safe to say that if these buildings were brought down by explosives, it was not done in a "Controlled Demolition?" As in, "Controlled Demolition" is the wrong terminology? Would it be more appropriate to say the most likely scenario is that well placed bombs brought down the towers, and not a "Controlled Demolition?" I would be interested to see Etienne Sauret's video of the South Tower. Jon Gold on Wed, 12/23/2009 - 10:27am. It's easy to scrub the sound of low frequency booms from a video. Raw footage in the documentary 911 Eyewitness has distinct massive BOOMS even from a distance, and that may be why they don't want this footage used in other well-made effective documentaries. bbruhwiler8 on Wed, 12/23/2009 - 12:06pm. Sound more like the wind blowing up against the microphone. That has been discussed at length on this site. dz was the one who originally posted the video clips from 9/11 Eyewitness to this site a few years ago. Are you saying that the majority of videos of the buildings collapsing are edited to take out the sound of explosions? Jon Gold on Wed, 12/23/2009 - 12:14pm. Thank you guys for keeping it civil, though. Back to the discussion about real vs. fake phone calls vs. lying, the related evidence, etc. loose nuke on Wed, 12/23/2009 - 2:30pm. RL McGee on Wed, 12/23/2009 - 2:36pm. Joe on Wed, 12/23/2009 - 3:38pm. I think the point is . . .
. . . that a high-tech explosive like nano-thermite detonates at a significantly lower decibel level than conventional explosives like RDX. It certainly isn't "silent," but wouldn't produce the very loud bangs that are heard in the video Mr. Gold posted above. JTL on Wed, 12/23/2009 - 10:55am. 1. Yes, I think nanothermite has some advantages, and one of them appears to be a degree of control over the sound produced. 2. In response to Jon: I would not say what we have cannot be called controlled demolition. I'd call it non-standard controlled demolition. It would have to be prepared with extreme care and it would have to be controlled to a very high level. There would also have to be a great many individual explosive units. 3. The various video clips from Etienne Sauret's film (WTC -the First 24 Hours) are being pulled from the internet, and I can't find a clip right now of the second major sequence in his film, where the ST collapses. But, of course, I've got the DVD and anyone can purchase it and download to their hard drive. In the meantime, for a sonogram showing (with special clarity) the first 2 of 8 audible booms on this clip, see my article, Did the Earth Shake before the South Tower Hit the Ground? Journal of 9/11 Studies, footnote 35. 5. I think we're now essentially starting a new thread, so I'll stop posting here on this topic. 911SATYA on Wed, 12/23/2009 - 11:34am. And a fresh blog (or front page) entry on the audible booms analysis would be welcome here. Student on Wed, 12/23/2009 - 1:07pm. everyone that participated in this little tangent. I think its a great example of constructive criticism and exchange of ideas. We may all vehemently disagree with eachother on a multitude of different points, but when handled in a responsible and respectful manner everyone benefits. zombie bill hicks on Wed, 12/23/2009 - 1:29pm. "A Creeping Horror and Panicked Flight as Towers Burn, Then Slowly Fall, p. A7 (continued from p. A1)"
Police officers warned people in the vicinity to move north, that the buildings could fall, but most people found that unthinkable. They stayed put or gravitated closer. Abruptly, there was an ear-splitting noise. The south tower shook, seemed to list in one direction and them (sic) began to come down, imploding upon itself. "It looked like a demolition," said Andy Pollock. "It started exploding," said Ross Milanytch, 57, who works at nearby Chase Manhattan Bank. "It was about the 70th floor. And each second another floor exploded out for about eight floors, before the cloud obscured it all." Several people voiced the thought: "Get out of here, the other tower's going to fall." People started walking briskly north until the premonition became real--another horrifying eruption, as one floor after another seemed to detonate. If there are no recordings of noise, that is obviously the fault of the audio equipment. pduveen on Thu, 12/24/2009 - 10:28am. If I am correct there is no evidence of where the calls originated, or I should say what is the evidence about the origination of the calls? Supposedly a caller ID will tell you the originating phone number of the call, but that can be faked too. by hackers. "Tracing problems are a relic of manual switchboards, which required operators to physically connect circuits. In order to track down a caller's location, police needed 10-20 minutes to figure out the maze of circuits....shorter calls could only be traced back...to a nearby switching station rather than the source phone." But phone companies started using electronic switching systems in the mid-1980s, so that a caller's number could be identified almost instantaneously, and cross-checked with an "automatic location indicator" for the address. Furthermore, many systems now include a call-tracing feature, triggering a trace when customers dial *57. The originating location of many cell phone calls, however, remains untraceable. (In 2003, only 15 percent of 911 centers could trace cell phone calls.) This inability has presented a problem for emergency service personnel, sometimes leading to tragedy. Although the FCC set a deadline of December 31, 2005 for "enhanced 911 services," in which carriers should have equipped 95 percent of subscribers with "location-capable handsets," the phone companies are behind schedule. More and more counties, however, are instituting cell phone tracing. And while privacy advocates may not be thrilled, those guys from "The Wire" should be happy. " So there is no way that any of those calls be be traced and the origin of them determined. This brings us back to the fact that if it was impossible to place a cell phone call from a plane especially above 5,000 the some of those calls were seemingly faked... ergo I would think all of them have the likelihood of being faked. Sandero on Tue, 12/22/2009 - 3:57pm. She did it before the plane was hijacked. Someone stole her card and swiped the card. Sandero on Tue, 12/22/2009 - 4:02pm. Thanks for clearing up this issue. So important to track down this kind of mistakes quick as possible. Can't wait for an update or response from David Ray Griffin himself. Waarheid911 on Tue, 12/22/2009 - 4:09pm. There are literally hundreds if not thousands of irregularities, contradictions and absurdities inherent in the official story of 911. It is counterproductive and unnecessary to focus on highly speculative theories about phone calls. This should be obvious. Assuming even one or two of the calls were real, such theories must be deeply offensive -- in fact, humiliating -- to family members on the receiving end. If I were to speculate, I would sooner postulate a scenario of "pseudo-hijackers" than "voice morphing". It is human nature, and therefore highly tempting, to try to fill in the blanks, but there is no need to speculate. Why not put the impetus on the defenders of the official story? Outlining elaborate theories when we don't know with any degree of certainty how the operation unfolded is irresponsible and gives ammunition to the anti-truth brigade. Not all theories are created equal. The "theory", or hypothesis, that Building 7 and the towers were demolished has been proven beyond reasonable doubt. We cannot say the same of the theory that Ted Olsen wanted to murder his wife, or that she is currently living in Paraguay. Danse on Tue, 12/22/2009 - 4:19pm. Thanks for saving me the time to write the same thing. zmzmzm on Wed, 12/23/2009 - 8:28am. I think the point here is that misinterpretations or other mistakes made by professionals like DRG, are used endlessly against them and against the case of 9/11, in the press and everywhere. We can't let that happen when the opportunity exists to restore these faults. I agree on your remarks about speculation or priorities. Waarheid911 on Wed, 12/23/2009 - 1:15pm. The length of your blog entry impresses. There are problems however. The relevant part: There was a second phone call... This time Barbara Olson was on the line when [Keyton] answered. She called direct. It was not a collect call. Barbara Olson said "It's Barbara." Keyton said, "He's on the phone with the command center. I'll put you through." So according to Keyton and the FBI, Olson DID get through, directly, for more than "zero seconds" on a direct, non-collect call. So what the heck IS the truth?!?! It's certainly not as cut and dry as you try to convince us. Incidentally, Jim, this red underlined part is the section of the FBI page that you didn't quote in your blog entry. You quoted the paragraphs above and below it. That was one problem I found when going through your essay carefully and checking the links you provided. So in an in depth look at what you provided shows that there are still contradictions even within the "official" sources of information and Ted himself. You made this out to be a cut and dry case: The phone calls happened, DRG is wrong, nothing else to see, let's move on. Adam Syed on Tue, 12/22/2009 - 4:59pm. i just addressed this in the DRG/CBC thread http://www.911blogger.com/node/22192#comment-224309 - as it was the 2nd call, and everyone in the US and probably the ATT operators knew the nation was under attack, the operator may have just put the call thru and not wasted time on processing it collect, as it was an emergency. And if the people at the FBI working on this part of the investigation were 'in on it', why is this 'anomaly' in the record? Why is the testimony of his secretary Keyton to a direct call allowed into the official record and allowed to be made public? loose nuke on Tue, 12/22/2009 - 5:51pm. Your point here is mere speculation. You can't use speculation to defend the premise that the "Olson lied" scenario is speculation while "Olson told the truth" is in fact truth. Olson changed his story several times and is non-credible on this point. Jimd3100's point of this blog entry, in short, was to demonstrate that even though the FBI records show that the one call identified to be by BO was unconnected and lasted zero seconds, that there were 5+ unidentified collect calls reported by the FBI as well (and indeed unidentified BECAUSE they were collect), and that these are almost certainly the genuine collect calls from Barbara on the plane. Now we read that his secretary says that indeed a direct, non-collect call DID go through. So what the heck is the truth? With regard to why this anomaly exists, your argument is one of incredulity. We could use the same logic and suggest: "If the US govt is in on it, why were they stupid enough to blow up a third building in broad daylight and give the game away?" But this incredulity does not negate the evidence for CD. Adam Syed on Tue, 12/22/2009 - 6:27pm. ...and regardless of how this issue is resolved, I certainly appreciate the TONE of your remarks - as opposed to the 'gotcha' attitude of the original post. dave mann on Tue, 12/22/2009 - 6:51pm. "Your point here is mere speculation." Right; that's why i phrased it as "possible explanation" and "may have". And to say the calls were faked or that Ted Olson, his secretary, the ATT operators and/or the FBI lied is speculation. However, some are claiming it's the most reasonable explanation, or even that it's a fact, which requires discounting or ignoring the evidence jimd3100 presented here. "So what the heck is the truth?" Until there's more evidence produced indicating the actual reason for this direct call, and many other details, these issues aren't going to be settled. loose nuke on Wed, 12/23/2009 - 9:23am. Adam said....."The relevant part: There was a second phone call... This time Barbara Olson was on the line when [Keyton] answered. She called direct. It was not a collect call. Barbara Olson said "It's Barbara." Keyton said, "He's on the phone with the command center. I'll put you through." "Voss believes that both calls were collect calls"
Adam said..."So according to Keyton and the FBI, Olson DID get through, directly, for more than "zero seconds" on a direct, non-collect call." "interviews with recipients (especially Lori Keyton who was answering the phone in Ted Olson's office on 9/11), plus interviews of family members of other Flight 77 passengers, has lead to the conclusion that all of these unknown calls were from Barbara Olson to her husband Ted's office." Adam said..."So what the heck IS the truth?!?! It's certainly not as cut and dry as you try to convince us." Why don't you use some common sense? Loose Nuke has explained this to you several times now, I'll do it again. B Olson was trying several times to get through by way of an operator using collect calls, 2 got connected long enough for her to talk to Ted. After the first went through do you really expect us all to believe even though the operator now knows that planes are being flown into buildings, and she has on the line a person, on yet another plane, who is claiming it also has been hijacked, and she has already confirmed that, yes, they will accept the collect call, and pay the charges, that she would still, even though the person probably only has moments to live, is going to keep her on hold, while she asks again "will you accept this collect call and the charges? Or is it more likely, that since she already knows they will accept the charges, and calls are being dropped constantly, (lots of calls were being dropped at the time especially on the east coast)she will simply put her through directly, in which Keyton wouldn't hear a recording, or an operator, only Barbara herself, which would lead her to think possibly it was a direct call. This can be solved by talking to all involved, which is what the FBI did. This is obvious in the documents. Adam said....."Incidentally, Jim, this red underlined part is the section of the FBI page that you didn't quote in your blog entry. You quoted the paragraphs above and below it." "This time Barbara Olson was on the line when [Keyton] answered. She called direct. It was not a collect call." But I provided all the documents for all to see themselves. So while you try to imply I'm being "devious" and "cherry picking" quotes.....it's YOU who is deliberatly "cherry picking" qoutes in a transparently pathetic attempt to discredit me, since you can't any of the points I make. Adam said...."That was one problem I found when going through your essay carefully and checking the links you provided." And "cherry picking" qoutes. LOL! That's it? That's your rebuttal? This article would seem to prove DRG and you are wrong every time you claim there were no Airphones on the plane, are you going to debunk it or admit they had airphones? Are you going to admit the Justice Dept according to their own documents support Olson or are you going to debunk this and continue to claim the FBI admitted Olson Lied? and then Dave Mann chimes in with this..."and regardless of how this issue is resolved, I certainly appreciate the TONE of your remarks - as opposed to the 'gotcha' attitude of the original post." I made it very clear in the article why I wrote it and it has nothing to do with playing "gotcha". It has to do with presenting real evidence as opposed to faulty theories. Meanwhile it's crystal clear to anyone reading this thread playing "gotcha" is exactly what you were doing. Which Dave seems to be ok with. All you really did was expose yourselves as a couple of hypocrits. How Embarrassing! jimd3100 on Thu, 12/24/2009 - 4:54pm. Do you think that SEEMS TO PROVE is in fact CATEGORIC PROOF?. Do you think that LEADING TO CONCLUSIONS is, in fact, CATEGORIC PROOF?. Do you think that what the FBI THINK! is, in fact, CATEGORIC PROOF?. Are you going to admit the Justice Dept according to their own documents support Olson or are you going to debunk this and continue to claim the FBI admitted Olson Lied?. Statement made includes ""While there was no direct evidence with respect to the "unknown calls" and "has lead to the conclusion that all of these unknown calls were from Barbara Olson"
Do you think that NO DIRECT EVIDENCE and LEADING TO CONCLUSIONS,according to the DOJ,s own documents, is CATEGORIC PROOF?. Trust me! you do not need any help on that score because the quotes you provide offer no CATEGORIC PROOF of anything.So what,exactly is there to discredit?..Answer me this,how much of your evidence would stand up in a court of law? I wager your case would be laughed out of court.There is no DIRECT EVIDENCE that what you claim to be FACT is anywhere near FACTUAL. I made it very clear in the article why I wrote it and it has nothing to do with playing "gotcha". It has to do with presenting real evidence . WOW i fear you have officially dissapeared up your own backside with this assertion.All you have,in fact ,done is parrot unproveable facts from unreliable sources.Ted Olsen had already proven his lack of integrity long before 9/11.He had already perjured himself in court,he had already,almost single handedly stolen an election on behalf of George Bush.On top of that he contradicted himself to quite remarkable precedents in reference to Barbara Olson,s phone call. Lori Keyton testified that she put through a direct call from Barbara Olson but that clearly did not happen.Therefore her testimony is highly suspect.Now what sort of person would use evidence from sources with absolutely no credibility and call it REAL EVIDENCE!. Well it is, in fact a fair comment and as such a fair rebuttal because it proves you have an agenda.
. All you really did was expose yourselves as a couple of hypocrits. How Embarrassing! The only embarrassing thing is that a so called truth seeker would rather take assumptions and assertions, from the DOJ and FBI over a man like David Ray Griffin.Name calling and insults are always the last tactic of a scoundrel who knows his argument has failed and in your case quite miserably so. Why don't you use some common sense? Loose Nuke has explained this to you several times now, I'll do it again. B Olson was trying several times to get through by way of an operator using collect calls, 2 got connected long enough for her to talk to Ted. COMMON SENSE! now that is funny and I will backtrack to the NO DIRECT EVIDENCE and the LEADING TO THE CONCLUSION statement.This is not about common sense it is about accepting ASSUMPTIONS as being FACT.No right thinking person should accept EVIDENCE when there is,indeed, NO EVIDENCE to back up the CONCLUSIONS.I really don,t need you or anybody else to convince me that having NO DIRECT EVIDENCE is in fact EVIDENCE, the complete opposite of what it is..
Telephonic technology is not something new,it has been around for quite some time.Using the analogy of a journey a telephone call has a starting point and an end point,where the call originated and where it ends.The really sad part in this story is that if the call originated from a known source and ended at a known source it would be very simple to confirm this fact.There is ,however,NO FACTUAL EVIDENCE,that this call originated from flight 77 and travelled it,s journey ending in Ted Olson,s office.NONE! NADA! ZERO ! NOTHING! and the DOJ and the FBI actually admit this absolute fact.What they did with this absolute FACT is make the story they wanted fit into the scenario they preferred.Then jmd comes along and turns the DOJ and FBI ASSUMPTIONS into FACT and on,of all things,a supposed truth site.Then at least 3 other people back up his ASSUMPTIONS dressed up as FACTUAL EVIDENCE on this supposed truth site.I really don,t know whether to laugh or cry,nearly 9 years and this is where you are,what a DISGRACE! . ROBBY B on Sat, 12/26/2009 - 7:04am. Robby B said...."Do you think that SEEMS TO PROVE is in fact CATEGORIC PROOF?" Yea, OK I'll consider changing "seems to prove otherwise" to "proves otherwise." Since it does. Thanks for the suggestion. Robby B said...."Do you think that LEADING TO CONCLUSIONS is, in fact, CATEGORIC PROOF?" It's more proof than you have of Olson lieing about getting calls from his wife since Ted didn't even accept the calls....his secretaries did. Robby B said...."Do you think that what the FBI THINK! is, in fact, CATEGORIC PROOF?" They've obviously investigated this more than you have. Robby B said....."Do you think that NO DIRECT EVIDENCE and LEADING TO CONCLUSIONS,according to the DOJ,s own documents, is CATEGORIC PROOF?" You seem to be confused and think Olson was on trial. He wasn't. But if he was, yea, they can produce the records of when the phones were used, and then produce the operators who took her calls and then produce the secretaries who turned the phone over to Ted Olson. They did the investigation but didn't put any of these folks on the stand because someone saying.... "I'm a 9/11 truther, and I think everyone at the pentagon was fooled into thinking they saw a plane hit and I think the relatives were all fooled into thinking they got calls,.....officer...arrest that man!" Isn't grounds for an arrest, which BTW needs to happen before someone goes on trial, and before an arrest is made evidence needs to be presented that would support an arrest warrant. All you have is a silly fantasy. Robby B said....."Trust me! you do not need any help on that score because the quotes you provide offer no CATEGORIC PROOF of anything. So what,exactly is there to discredit?" So what,exactly is there to discredit? This....it seems to prove that airphones were on AA planes in 2001. Are you going to discredit it or not? "The FBI is part of the Department of Justice, and yet its report undermined the well-publicized claim of the DOJ’s former solicitor general that he had received two calls from his wife on 9/11." Does this sound like the Dept of Justice undermined Olson? 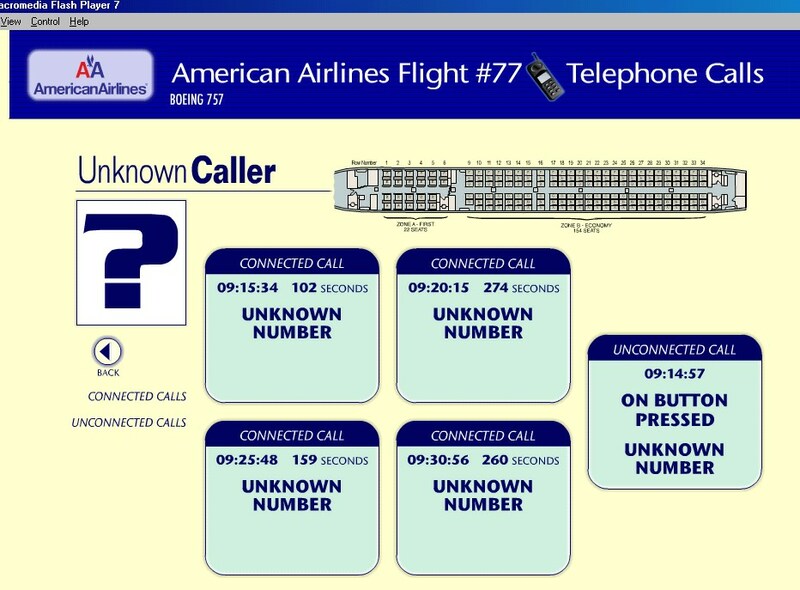 "Event: Department of Justice briefing on cell and phone calls from AA Flight 77" has lead to the conclusion that all of these unknown calls were from Barbara Olson to her husband Ted's office." Robby B said....."Answer me this,how much of your evidence would stand up in a court of law?" All of it since it came from the Dept. of Justice and FBI investigations. How much of your "calls were fake" beliefs would stand up in court? Robby B said...."I wager your case would be laughed out of court." What case? What court? What are you talking about? Robby B said...."There is no DIRECT EVIDENCE that what you claim to be FACT is anywhere near FACTUAL." You can pretend all you want that the operators and secretaries don't exist, and back up Olsons story, it's called denial. Robby B said....."WOW i fear you have officially dissapeared up your own backside with this assertion.All you have,in fact ,done is parrot unproveable facts from unreliable sources." Oh....so a document from the FBI showing 1 call for 0 seconds is reliable, but any other documents from the FBI explaining the calls are unreliable....yea...it's called denial. Robby B said...."Ted Olsen had already proven his lack of integrity long before 9/11. He had already perjured himself in court,he had already,almost single handedly stolen an election on behalf of George Bush. On top of that he contradicted himself to quite remarkable precedents in reference to Barbara Olson,s phone call." Like I said, not liking Olson is no reason to accuse of of lieing, and being "in on it" when the evidence goes against it. And what was his sentence for his perjury? That didn't happen. And from day one he stated he didn't know if the calls were cell phone calls or Airphone calls, so you need to accuse his secretaries and the operators of lieing, too.....they must all "be in on it", because your proof of a mysterous member of the NWO using their nifty new voice morphing technology doesn't exist. You seem to think baseless accusations is the same thing as proof. It's not. Robby B said...."Well it is, in fact a fair comment and as such a fair rebuttal because it proves you have an agenda." I already admitted my agenda, it's for the truth movement to promote real facts instead of faulty theories. Your agenda seems to be to stay in denial and make baseless accusations. Robby B said...."The only embarrassing thing is that a so called truth seeker would rather take assumptions and assertions, from the DOJ and FBI over a man like David Ray Griffin." By assumptions and assertions you mean....documents and investigations? Your hero worship is clouding your thinking. Or lack of it. And you seem to be ok with DRG using assertions by the FBI, as long as the other assertions ruining your "belief" are left out. Robby B said...."Name calling and insults are always the last tactic of a scoundrel who knows his argument has failed and in your case quite miserably so." Robby B said...."COMMON SENSE! now that is funny and I will backtrack to the NO DIRECT EVIDENCE and the LEADING TO THE CONCLUSION statement." Robby B said...."This is not about common sense it is about accepting ASSUMPTIONS as being FACT." You mean like ....since voice morphing technology exits, that was what was used on the phone calls. It's a fact. You mean like that? jimd3100 on Sat, 12/26/2009 - 5:23pm. We have Flight 93 passengers' conversations being picked up on the flight deck even though the cockpit door is CLOSED! We have caller ID from Deena Burnett affirming that several cell phone calls, placed by her husband Tom on Flight 93, connected from 30.000 feet plus! We have Flight 93 landing at Cleveland Airport (under different flight numbers) around the time Flight 11 impacted the North Tower. That means the passengers said to have boarded Flight 93 at Newark Airport DIDN'T! Get it, folks? 3. selective use of voice morphing for some passengers, while other passengers are "in" on the operation. brian78046 on Tue, 12/22/2009 - 5:43pm. Whatever the merits of the article may be, the title "'Fake' phone calls? What the evidence shows" is misleading. The author wants to talk about the Olson calls. So entitle the article, "the Olson calls." This article barely touches on the complexity of the phone calls as a whole. 911SATYA on Tue, 12/22/2009 - 5:53pm. I see a number of comments in this thread that have interesting things to say about remaining issues relating to the phone calls that supposedly came from the flights in question; to what really happened on those flights; to what really occurred at the Pentagon. But I would hope that, whatever our opinions concerning all of these topics, we can appreciate these basic points from the above post. 3) So what if what Griffin said on these issues is inaccurate; it doesn't really matter. Is there anyone here prepared to make such arguments? Without going off onto other tangents? rm on Sat, 01/02/2010 - 9:06pm. Griffin continues to raise provocative questions about the inconsistencies and contradictions of the official version of the events of September 11, 2001. MrEguy on Tue, 12/22/2009 - 5:53pm. The following link allows listening the two messages of Ziad Jarrah at 09:31:57 and 09:39:11. Normally one should hear the same voice in the two messages. But is this really the case? Note that in the second message " Ziad Jarrah " speaks more slowly and with a slightly different accent. tit2 on Wed, 12/23/2009 - 6:28am. tit2 on Wed, 12/23/2009 - 7:45am. How to destroy one's credibility in a single sentence. "Ted Olson wasn't on trial so there was no need to prove anything in regards to him or his phone calls." This statement is ludicrous. It's hard to believe a serious researcher would say such a thing. For one thing, in any such trial--whether it's Moussaoui or KSM or whomever--there's a sense in which the whole official narrative is on trial. My understanding is that AA77 was the only flight that was lost to primary radar. The FAA even briefly entertained a report that the flight had crashed near the Ohio/Kentucky border. The high speed craft that was subsequently seen heading toward DC was never positively identified as AA77 before it (or whatever) crashed into the Pentagon. The alleged calls from Barbara Olson were actually among the few scant pieces of evidence that AA77 was still aloft in the remaining minutes before the Pentagon was struck. They were far from insignificant, as they were crucial to implanting that part of the story in the public mind. The emotional impact of Mrs. Olson's fate was also played up relentlessly, particularly on the mainstream Right. To say that, because Mr. Olson wasn't on trial, there was no reason for the FBI to turn in an accurate report is ridiculous, especially when the supposed inaccuracy was bound to raise eyebrows--and a few questions. The other pieces of evidence above showing endorsements of Mr. Olson's story of course are significant in themselves, but the way they are presented obscures a key point: the FBI's report changed the story. There's been a lot of that over the past eight years, (as with the three versions of the OCT we've been handed.) It is entirely reasonable for Prof. Griffin to point this out. And it is certainly legitimate to ask why this was done and consider its ramifications. JTL on Wed, 12/23/2009 - 6:54pm. The actual statement is "While there was no direct evidence with respect to the "unknown calls," interviews with recipients (especially Lori Keyton who was answering the phone in Ted Olson's office on 9/11), plus interviews of family members of other Flight 77 passengers, has lead to the conclusion that all of these unknown calls were from Barbara Olson to her husband Ted's office." Do I need to explain what "NO DIRECT EVIDENCE" and "CONCLUSIONS " mean in a court of law?. UNKNOWN! means exactly that,not confirmed,not verified,not substantiated.The only thing that can be confirmed is that Barbara Olson made only one verifiable call that was not connected,the rest is heresay, conjecture.presumptive conclusions and guesswork. This appears to be good enough for some of you and that really is kind of sad. ROBBY B on Wed, 12/23/2009 - 11:40am. while there may be no "direct evidence" that these calls were from Barbara Olson to Ted Olson, there are FBI 302 reports of 2 ATT operators, Lori Keyton and Ted Olson of 2 calls. There's no evidence, direct or otherwise, that these calls didn't happen, that the witnesses are lying, that the FBI made up the reports- or that the calls were faked. So why are people claiming calls were faked- something for which there is no evidence? And when there is evidence the calls happened? loose nuke on Thu, 12/24/2009 - 11:03pm. 9/11 Eyewitness is probably the best audio that I've heard. I know Seigal isn't well liked around here, but for authenticity, its probably one of the best. justacitizen on Wed, 12/23/2009 - 5:53pm.